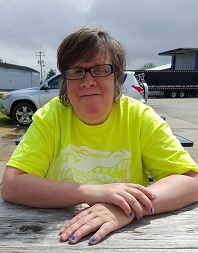 Carol is known at DSC for being a hard worker and for her love of socializing with others; she enjoys engaging in conversations with everyone at DSC. Carol likes works in a few different locations while at DSC. She does various work activities but her favorite task is assembling caps for Caterpillar. Carol lives in a group home which suits her friendly personality perfectly. Once every other week, Carol works with her house manager to plan an activity and help cook dinner. She also helps with wiping down counters and tables, unloading the dishwasher and vacuuming. In her free time, Carol practices singing with the Parkland Pops once a week. The Parkland Pops is a small chorus group lead by DSC staff member, Brian Hagy, and a select group of faculty from Parkland Community College. The chorus is open to all community members.Parkland Pops have an upcoming 50’s Sock Hop themed show on Saturday May 14th at 1pm. This free concert will be at the 2nd Stage at Parkland College. Please come out to enjoy and support this great group of performers!